The Two Handed Great Sword Ad copy and promotional video by Cold Steel certainly make this seem like a very impressive sword. "Our Two Handed Great Sword is the biggest sword we make. But don't let its size fool you, as there is nothing awkward or clumsy about this awesome sword. Sure it's big and meant to be carried over the shoulder, but it's extremely well balanced and easily wielded by people of larger stature and physical strength. The Two Handed Great Sword is sturdy, strong and battle ready. 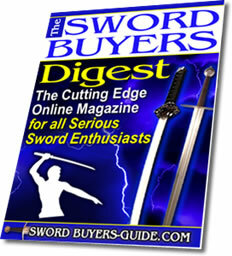 If you're looking for the ultimate in big performance oriented swords, your search is over." It sounds good in theory, but with such bold marketing claim - you'd better believe that someone from SBG will want to test it out in the real world..
My first encounter with this sword was at a sword/fantasy/RPG game store. 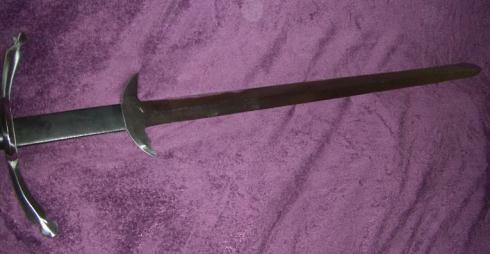 The sword was originally marked $450 and it was a bit out of my price range. 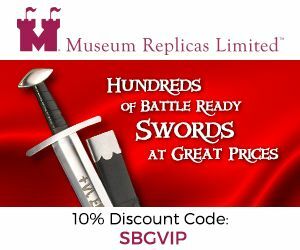 The store later had problems with its insurance company demanding that all swords be behind a glass display case or their rate would sky rocket. 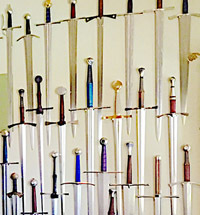 The store decided to no longer carry swords, save for a few that actually did fit in the small display case. All swords were marked down to half off, bringing this sword to a mere $225!! This price I could not pass up and needless to say, it did not go back on the shelf. The sword felt awesome. 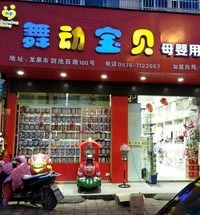 It was massive and heavy, but not cumbersome or difficult to handle. One couldn’t help but feel the greatness of this sword. Just holding the sword, you can imagine the powerful cuts, chops and thrusts this sword could produce! No doubt that the sword description provided by Cold Steel is dead on. Parry Hooks Width: 6 1/4"
The blade on this sword is longer than many swords' overall length. 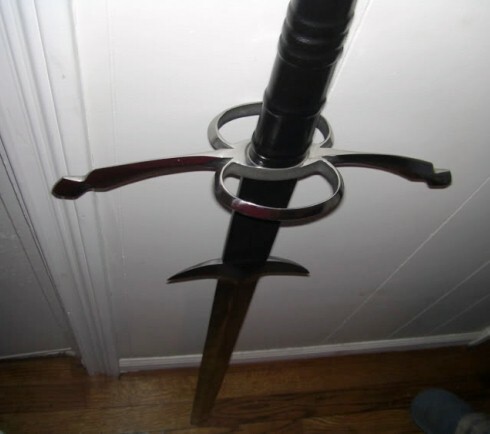 The blade section between the guard and the integral parry hooks is leather wrapped to allow the blade to be grasped if the battle turned closer quarters than the user wanted. This allows the blade to be maneuvered quicker and more accurately. 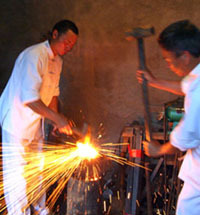 The steel is very smooth and no hammer marks are observed even though it is reported as being hand forged. 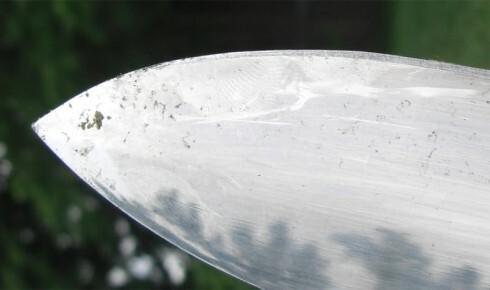 The sword blade is about as sharp as a Windlass sword that has NOT been through the sharpening service. 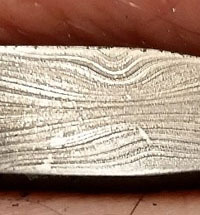 According to Cold Steel, this was the ideal edge for downing charging horsemen and cutting the heads off pikes. I decided to sharpen one side and left the other at factory specs. Sharpening the blade was extremely easy. I used a handheld sharpener similar to the one Paul Southren used to sharpen the DSA Medieval Knight Click here for more info on this sharpening method). It only took about 5 or 6 good passes before the edge was capable of slicing my thumb open! The grip is tightly wrapped in a rich, blue leather and perfectly molded to the wooden handle. 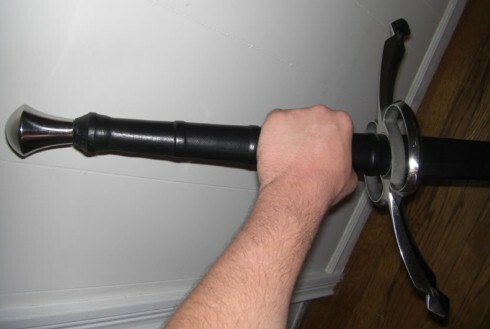 The massive grip is comfortable to hold and makes wielding the sword controllable and effective. 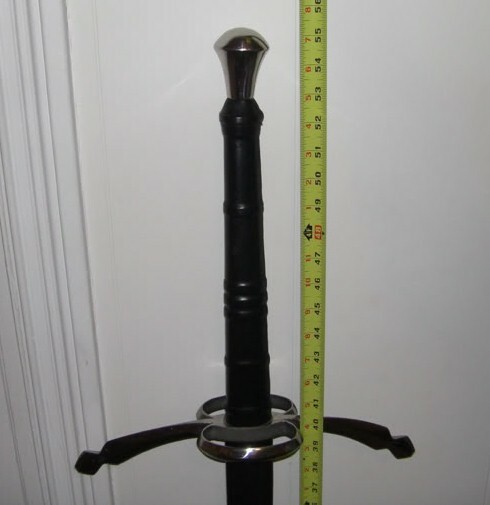 The pommel is highly polished and fits the style of the sword. Nothing really spectacular about the pommel to comment about other than it is made of solid steel and is heavy. It truly does bring the balance of the sword near the guard. If the situation called for it, the pommel could without doubt deliver crushing blows that could easily injure or kill an opponent or destroy armor. This sword is meant to be carried over the shoulder. So no scabbard. The guard is beautifully made (in my opinion) and, as with the rest of the sword, is enormous! At nearly 14", it provides ample protection to the hands. 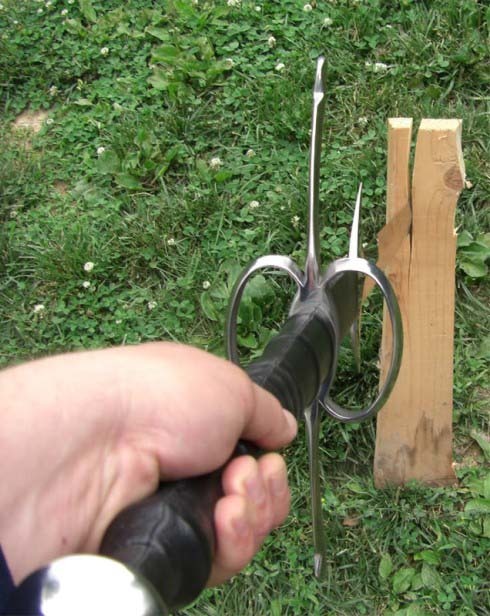 The addition of the side rings provides further protection as well a way to trap or damage an opponents sword. I was pumped about testing this sword out! With its massive blade, I was expecting big things from this sword. 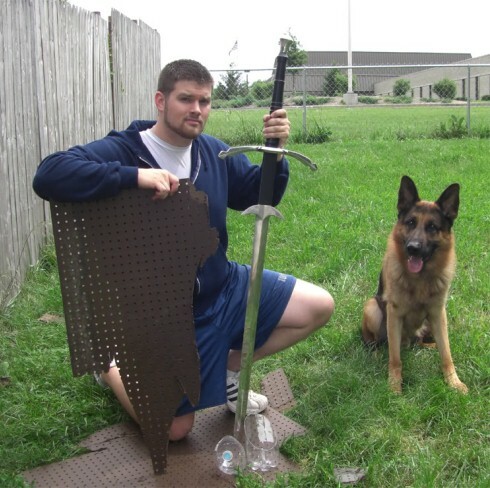 I tested this sword the same time I did my tests on the Ritter Steel War Sword, so the tests were the same. I started with a high density ¼” peg board that was secured in between a section of my wooden fence. The peg board was harder and seemed more of a challenge than a standard piece of ¼” plywood. The first cut I made was using the factory edge. The cut was deep and impressive for essentially a “dull” blade. 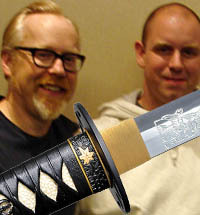 I then flipped the blade to utilize the sharpened side. The first cut with the sharp side cut so deeply into the peg board that it caused the entire corner of the board to break off. I moved the cuts to a more central location on the boards to prevent losing more of my target. The next cut was just as deep and powerful. After the tests only wood markings were left on the blade with absolutely no damage or dings in the steel. 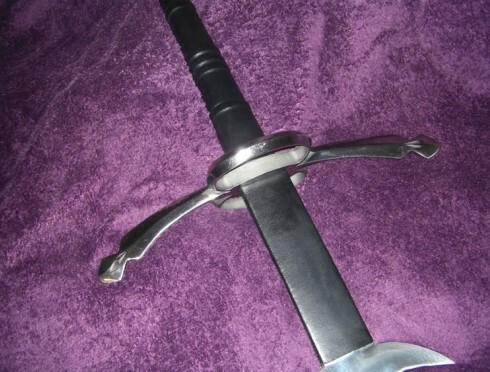 The steel was difficult to clean, but with the use of a rotary tool and a wire brush wheel, the markings came right off to make the sword look like new. 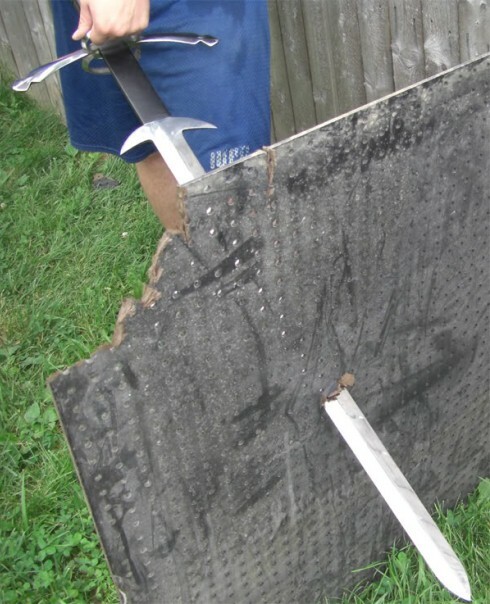 The next cuts were made on the remains of the 2"X6" plank that was split with the War Sword. The first cut sunk nearly halfway into the plank! It nearly split the remaining section in half on the first attempt. I wanted to completely split the plank on the 2nd cut and I put some muscle into this next cut. This is when I nearly soiled myself. My aim on the plank was slightly off and I just caught the side of the plank. 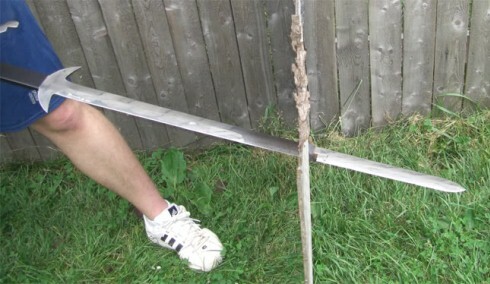 It quickly cleaved the small section off cleanly and continued till the concrete porch stopped the massive blade. A shock was sent through the blade and it took me a second to realize what happened. 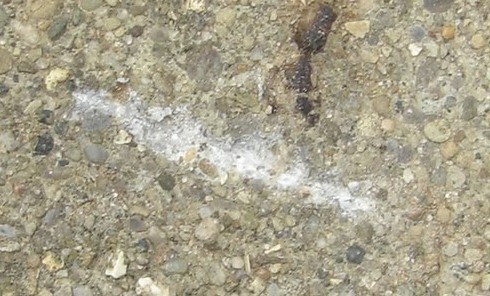 I immediately saw a gouge in the concrete where the blade made impact. I paused for a second, afraid to examine the damage on the swords edge. What made me even more scared was that I knew it was near the tip of the blade where the impact happened. I finally gritted my teeth and held the blade up to inspect it. I could hardly believe it… not a scratch on it!!! It was completely unharmed!! I had to take a picture to prove it! I guess I shouldn’t have been too surprised when I consider who made the sword (Cold Steel). 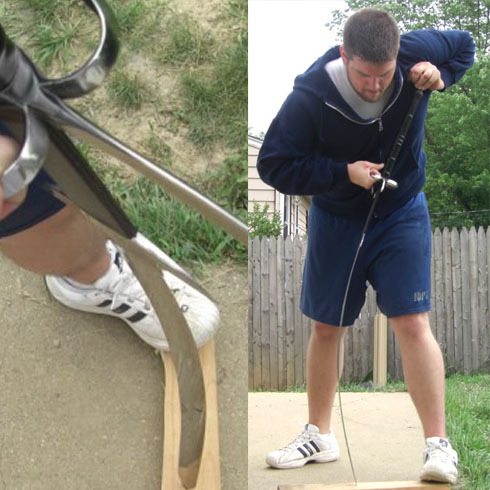 The next test for the two handed Great Sword was cutting the 2 liter bottle of water. I had no idea how this was going to turn out. I didn't expect the sword would cut the bottle correctly being that it was so large and not thinking it was designed for this type of test; but I did it anyways! As I lined up the sword to the target, I half expected the blow to cause the bottle to just explode from the sheer force. I quickly made the cut and was nearly thrown off balance from the weight of the blade as it easily passed through its target. The bottle was cleanly cut in two. Again, I was impressed that such a large sword was capable of such results. I hadn't had a chance to test the sword's thrusting ability, and my target selection was running thin, so I returned to the peg board. Being that one end was virtually unsecured (side opposite the fence) I felt that might be a good place to attempt the thrust since it would give if the point weren't sharp enough. I gripped the sword by one guard ring and on the grip and thrust it as if it were a battering ram. The board barely had a chance to yield and the blade penetrated the board more than 14". After the thrust was made, I proceeded to destroy the rest of the peg board as you can see in the bottom picture. Anyone who has seen the Cold Steel Sword Proof videos knows that this sword can flex. I decided to test it myself. I placed the tip of the sword on the 2"X6" and flexed it. The sword was much more difficult to flex than I anticipated. I had to put most of my weight and strength into it to get a satisfying flex out of it. The sword quickly bounced back and returned to true. I know it’ll flex further but I just couldn't get any more leverage on the blade without putting it into a vice. 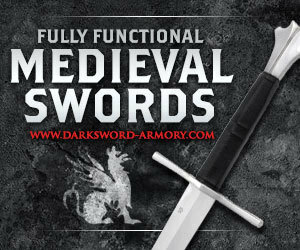 This sword has seemed to prove just as tough as the demonstrations performed by Cold Steel makes them out to be. The description is true about being of larger stature and strength being necessary to wield the two handed Great Sword. After making several heavy cuts and intense dry handling, my forearms burned! It was a great feeling!! If you couldn't already tell, I would definitely recommend this sword to anyone interested in a large sword! 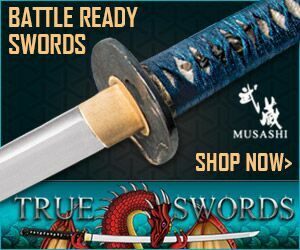 The Two Handed Great Sword sells at Cold steel for $549 - however its is not necessary to spend anywhere near as much to get this sword from some of their authorized resellers. 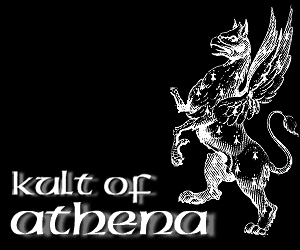 Because of its weight and size, the overall best price must factor in shipping costs, so the best place to buy it is here at Kult of Athena where they go out the door at just $319.95. I hope this review of the Cold Steel Two Handed Great Sword has been helpful. 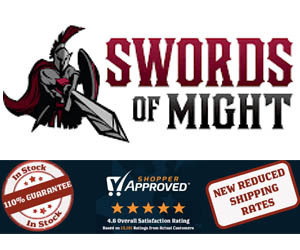 To return to Affordable Replicas of Medieval Swords from Cold Steel Two Handed Great Sword Review, click here.